Last month, we partnered with Brian Baldrati and his travel company Is This Real Trips to host a group of Brazilian travelers who had come to see the “real” India. Part of their trail were the more touristy sites such as the Taj Mahal and New Delhi, Jaipur as well as the Thar Desert. In order to create a program for them that was different than what is already tried and tested, we included activities that helped support various non-profits and small businesses along the way. Here are 3 favorite moments from the trip. We took the travelers to the Sheroes Hangout Cafe owned and operated by acid attack victims. Many of the victims had their own parents and siblings throw acid on them. They have built an incredible non-profit that supports, sheds light and does advocacy work for acid attack victims. Also, the women are incredibly happy and loving and the food is delicious. When we asked one of the travelers, how they felt after visiting the cafe, their answer was “happy because the women are happy”. Make sure not to miss the Sheroes Cafe if you are visiting the Taj. In addition, follow @isthisreal on Instagram as he took 3 lovely ladies to the Taj Mahal during sunrise to do beautiful portrait photography. Stay tuned as he explains more about this important initiative and what we can do to help. 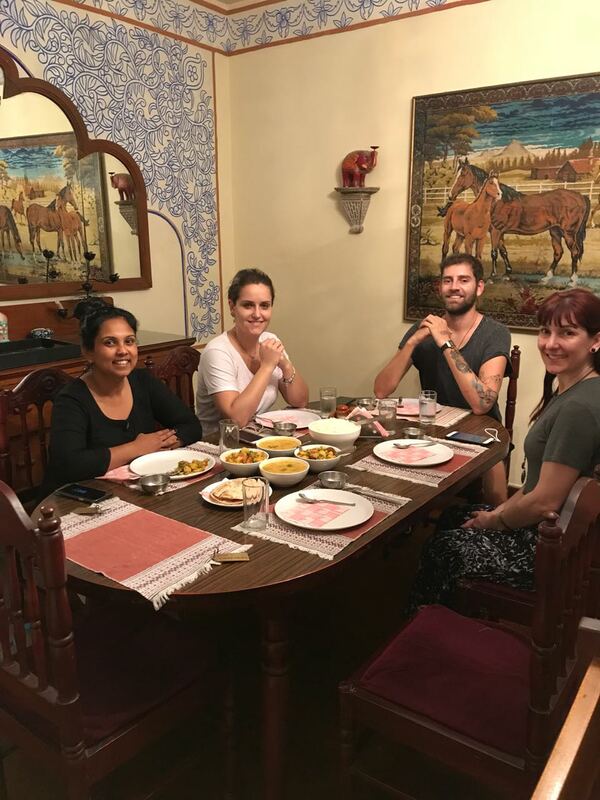 When we visited Jaipur with the group, instead of opting for one of the hostels or corporate hotels, we chose to stay at a small bed and breakfast with descendents of a royal family. With only 8 rooms, the BnB was an extension of the family’s house. We woke up in the morning to chickens and ducks in the courtyard garden, used auto-rickshaw drivers that had been working with the family for over two decades instead of a taxi, and ate a homey simple dinner in a beautiful dining room that was essentially just for us. By being intentional of where we stayed, we were able to support the family, the father and son who drove us around in their auto-rickshaw and see remnants and artifacts of the royal family. In a world of Ikeas and Amazon, it is crucial that we use our purchases when we travel to support art and artisans that are painstakingly keeping artistic traditions alive. Instead of going to a more commercial place selling mass-produced paintings, we took our travelers to an artist in the royal city who has been making paintings for decades in the city. His hand-crafted paintings were exquisite and made a fantastic gift for souvenirs. Whenever and wherever we travel, we believe in experiencing and supporting artists. Looking for more off-the-beaten path experiences while traveling to India? Visit our Ongoing Trips page to see which trips pique your interest.